Okonjima Plains Camp is nestled amongst the Ombokoro Mountains - a Herero name meaning, 'place of the baboons'. The camp is family-run and is also the home of the AfriCat Foundation, a charitable organisation that rescues and relocates cheetahs, leopards and other predators. The main camp's accommodation consists of Standard Rooms and View Rooms, each either overlooking the waterhole or the plains. The lovely main areas include a lapa, swimming pool and entertainment area. Activities available from Okonjima include radio-tracking rescued cheetahs and leopards on foot. There is also the opportunity to visit the AfriCat centre and join a guide on an informative and interactive Bushman trail. Nearby, Okonjima's award-winning private villa and bush suites give a more luxurious safari experience, with each including a private chef, guide and safari vehicle. 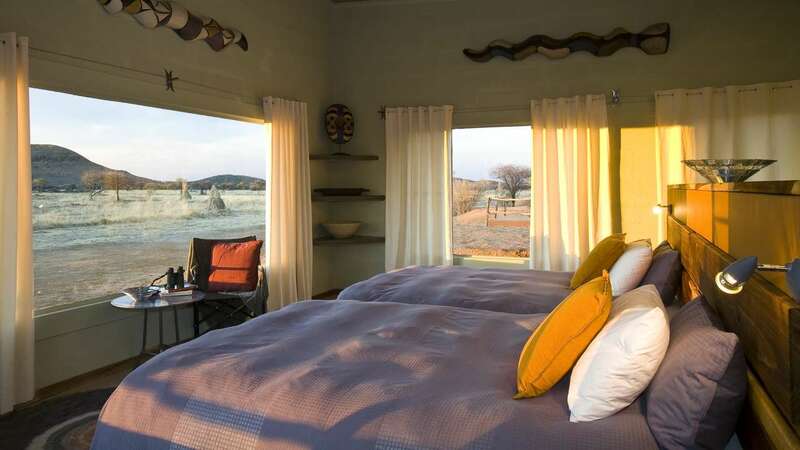 Okonjima Plains Camp is a great place to stay and experience conservation at its best. Okonjima Nature Reserve continue to work towards saving the large carnivores of Namibia since 1993.